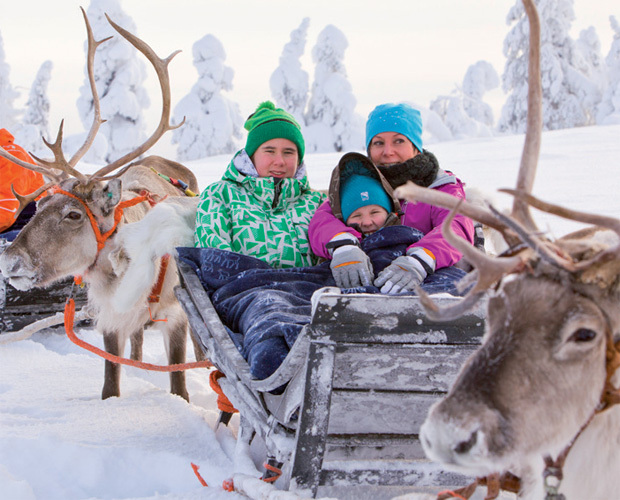 There's nothing more magical than a festive familymoon to Lapland, discovers Demelza Rayner. Glancing casually at the weather app on my smartphone one chilly December morning, I suddenly did a double take. How could it possibly be minus 26 degrees outside? But then again, I was in Lapland, where temperatures have been known to reach a frostbite-inducing minus 45 degrees. There are many reasons to visit this northernmost part of Finland, deep inside the Arctic Circle, but before Christmas it's the lure of the jolly man in red that sees families flock in their thousands to this wintry wonderland. Indeed, this destination couldn't be more perfect for couples wanting their children to share in the excitement of a post-wedding break: memories made here will last a lifetime. My six-year-old son – along with a number of other lucky youngsters – had received his personalised invitation to visit Father Christmas at Santa's Lapland a couple of weeks before departure, so it was no surprise that when we boarded the plane, the sense of anticipation was palpable. The journey from East Midlands Airport to Ivalo took a mere three-and-a-half hours, transporting us from lush green countryside to captivating icy terrain. Imagine Disney's Frozen combined with The Wall from Game of Thrones, and you'll be part-way to understanding Lapland's awe-inspiring, yet utterly enchanting, snowy landscape. Snow boots and ski jackets at the ready, we disembarked and gingerly navigated the short walk to the terminal where some elves – yes elves – were waiting to greet us. Bedecked in red and green, with their trademark rosy cheeks and jangly hats, they happily chattered away, while playfully interacting with their audience. Outside the terminal building our coach transfers were ready and waiting, so once we'd enjoyed our first snowball fight of the year, and posed for a selfie with one of Rudolph's relatives, we were on our way. Speeding through dense forests of snow-capped pine trees, the lively guide from Santa's Lapland talked us through the itinerary for the duration of our stay and encouraged us to look out of the window in case we were lucky enough to spot some more elves. As chance would have it, we glimpsed several by the roadside – all waving and smiling as we drove past. Temperatures in this part of the world are often substantially below zero, so our first stop was to collect our thermal clothing - boots, socks, gloves and all-in-one suits designed to keep us snug and dry. What the attire lacks in glamour, it more than makes up for in practicality - just don't forget to wear thin woollen layers underneath for added warmth. Our accommodation for the next three nights was Santa's Hotel Tunturi in Saariselka. Rustic and comfortable, it was the perfect base from which we could explore the surrounding area. My son was delighted to discover the complimentary toboggans stacked up outside and we were soon striding towards the nearby run for our first taste of winter sports. While most children made their descent from halfway up the hill, the bigger kids among us - my husband and I included - made our way to the top and really picked up some pace on the way down. 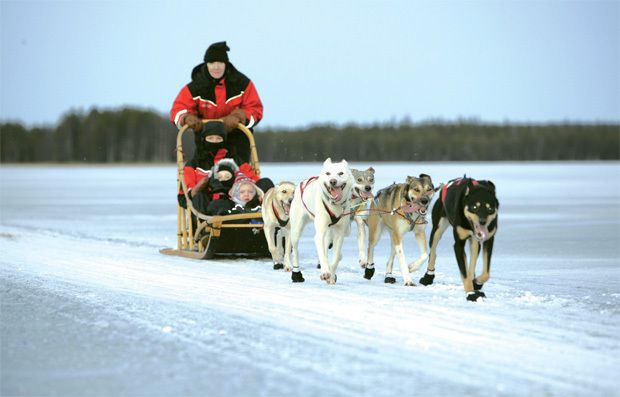 Travelling with Santa's Lapland, only the 'Search for Santa' day is fixed, meaning the rest of your time is free to enjoy the plentiful activities, from snowmobiling safaris and cross-country skiing, to Northern Lights tours and husky sledding. What could be more romantic than catching a glimpse of the Aurora Borealis lighting up the star-studded sky, or snuggling up to a loved one on a reindeer sleigh? Santa's Lapland comes with a handy half-board meal plan and food at the Hotel Tunturi is delicious and plentiful. An added beauty of staying in Saariselka is that it's a fully operational town, not just a tourist trap, with restaurants serving hearty Finnish fare such as fish broth, reindeer stew and even elk - not something you'd find at your local supermarket back home. The third day of our trip was undoubtedly the highlight. Thankfully, the temperature had risen to an almost balmy minis 3 degrees so when we arrived at the Arctic Circle Centre our thermal suits felt positively toasty. With mini skidoo, toboggan and ski rides on offer, as well ice hockey and ice fishing, it was hard to know where to begin. Thankfully, visitor numbers are carefully monitored so there's rarely a queue for anything. There's only one mode of transport available to reach Santa, and that's by snowmobile-pulled sleigh. Handing our golden ticket to the driver, we all snuggled under a thick blanket and were whisked away on a wonderful, winding, magical mystery tour through the Narnia-like forests. After around 15 minutes we stopped outside a quaint fairytale wooden lodge - Father Christmas' workshop - and were met by some excitable elves who entertained us for a few minutes before we met the man himself. Eyes wide, my son was instantly captivated by the sight of Santa who was everything we'd hoped he would be, and more. Generous white beard - check, snug red and green suit - check, deep belly laugh - check! Surrounded by a mound of presents, all precariously piled on top of one another, he was engaging and jolly. What's more, he somehow knew all about my son's likes and dislikes - much to his amazement! While seeing Santa was certainly the highlight, I have to say that husky sledding came a remarkably close second. Following a quick demonstration about how to steer and stop the sled, we jumped on board and set off at a jaunty speed. Going first gave us something of an advantage - our only task being to follow a snowmobile leading the way, rather than being governed by the speed of the husky team in front. We sped through the enchanting pine forests on an adrenaline-fuelled adventure. Halfway through there's the opportunity to swap drivers, and I was thrilled to navigate our husky team to the finish line. The sun sets incredibly early in Lapland so we took our reindeer ride in the dark, the route lit by beautiful fairylights - I couldn't have felt more romantic. We alighted the sleigh and found our way into a nearby igloo decorated with intricate ice sculptures and - better still - a bar serving beer, wine and rich, delicious hot chocolates - bliss. Outside, there was a slide carved from the ice which my son and one of his new friends took turns throwing themselves down - thankfully the thermal suits provided plenty of padding! 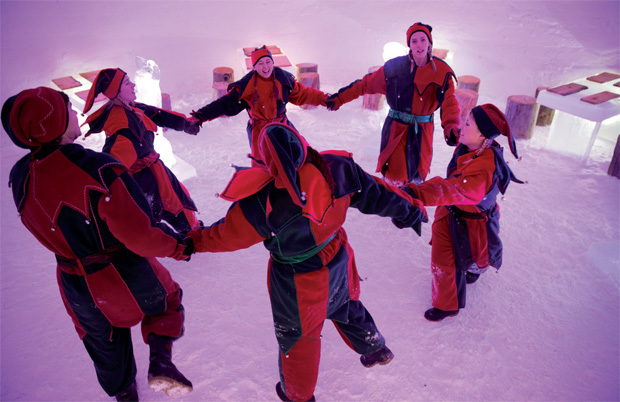 Another igloo housed a fun interactive theatre performance, while the last provided a walk-through experience with mood lighting and further ice sculptures. Coaches back to Saariselka leave regularly from the Arctic Circle Centre, so exhausted and elated in equal measure, we eventually headed back to the hotel in preparation for a gala dinner. Sat with several other families we'd met during our stay, we enjoyed a delicious three-course meal while the compère called up families one by one to receive their certificates in husky handling. Children danced the night away with a disco, leaving the adults some 'free time' to toast an incredible family getaway. Everyone was in a sociable mood, buoyed up by their shared experiences. On day four, if you still haven't had your fill of yuletide activities, the morning's free to spend however you choose. We headed back to the toboggan slope, where we enjoyed a precious hour repeatedly trudging up the snowy hillside before a manic yet exhilarating descent. Later that day, as we reluctantly loaded our bags onto the coach, it was clear that the elves and Santa had us firmly under their spell. Visiting Finland is a truly special pre-Christmas break and the sense of wonder is felt long after you return home. 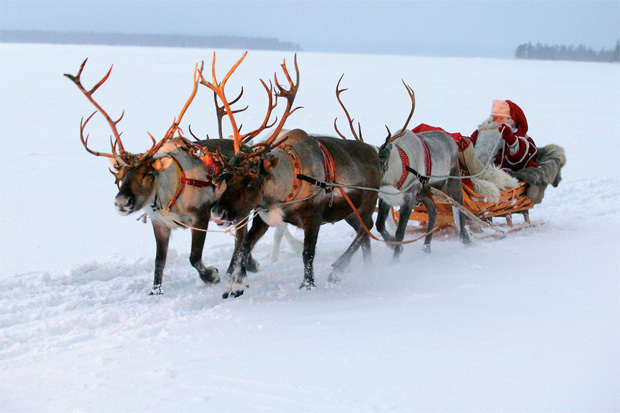 Contact Santa's Lapland on 01483 791 945 or visit the website at www.santaslapland.com. Santa's Lapland also fly from 19 other UK airports.